Regional: European Union governments aim to deny the right of asylum to innumerable refugees by funding and building a system of refugee camps and detention centers across Africa. A policy document approved at a meeting in Luxembourg of EU ministers called on states to ensure that those migrants deemed not to be refugees and ordered to leave, should do so. Some 470,000 expulsion orders were made last year but fewer than 40% were enforced. The camps and detention centers are to be set up specifically to house expelled EU migrants and to prevent further applications of asylum. The policy document also called for more “leverage” to be exercised on African and other poor states, including via aid budgets, to make them accept the return of citizens refused entry to Europe. Refugee advocates fear that the policy will see more people from the region locked up on the basis of their migration status. France’s migrant “cemetery” in Africa. 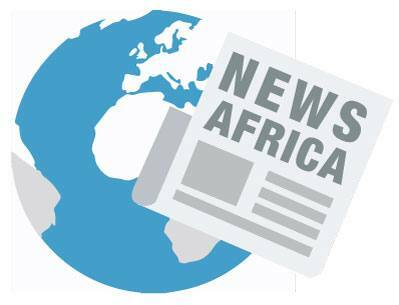 Niger: Prominent Nigerian journalist, Lawan Adamu, has been arrested, and is in a detention facility in the desert town of Agadez, Niger Republic, while on mission to investigate migration of Africans to Europe through the town. 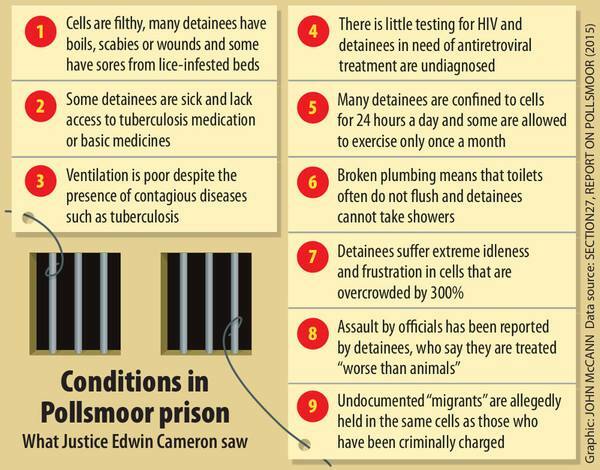 South Africa: Conditions at Pollsmoor Prison “profoundly disturbing”. New report from Constitutional Court judge Edwin Cameron finds appalling conditions in the Cape Town remand and women’s centers, and draws attention to the detained undocumented foreign nationals being held in the prison. Whilst those detained on the basis of their immigration status are meant to be housed separately in the prison – they aren’t – delayed decisions by the Department of Home Affairs on their immigration status means that some are kept longer than the maximum 90 days permitted by law, “which means the migrants are being held by Pollsmoor illegally”, the report finds. Malawi has become a significant transit country for Ethiopian irregular migrants attempting the journey through the southern corridor towards Mozambique and Zambia, en route to the continent’s most prosperous economy, South Africa. A growing number of those making the journey are unaccompanied minors. Sentenced for illegal entry, Ethiopians detained in Malawi’s overcrowded prisons, are often held beyond having served their 6 months sentence, or after fines have been paid, due to a lack of resources for repatriation. Over the past month the IOM has began the process of voluntary repatriating 387 Ethiopians of whom 36 are children. Kenya: “The Other Refugee Crisis”. New York Times considers alternatives to restrictive conditions in the world’s largest refugee camp Dadaab. Author Ben Rawlence suggests that a classification of the camp and others like it to an ‘autonomous open city’, where those with UN documents are permitted to move and trade within the normal international visa regime, could meaningfully address the permanency of such camps and the legal limbo of its residents.